Last night, in a class discussion about discipline, we were sharing examples of discipline challenges. 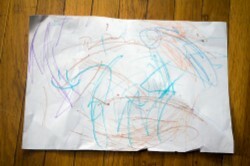 One mom said sometimes when she puts out paper and markers, she tells her child he needs to keep the markers on the paper, and not draw off the edges of the paper onto the table. Yet, he often draws off the edges, looking up at her to see her reaction. Motivation: I also think that what form of discipline works depends on your motivation and your child’s motivation. For example, if you really want your child to love doing art, you might think about ways to do art that don’t make messes that trouble you, so you might take your child and the chalk and go outside. But, if your motivation was to get your child to sit still for just a minute while you cook, then you may try something other than an art project. If your child loves doing art, then the consequence of “I will take away the markers” would be a big motivator to try to do things differently. But if they’re not that motivated to do art, then they’ll probably just continue drawing on the table so you will take the markers away and maybe give them something they think is more interesting to do. For more thoughts on motivation, read this post on Motivation, Punishment and Reward. Relationship: But today, as I thought about temperament and I thought about motivation, I realized that really the key to deciding which discipline tool will work for you and your child in the moment is Relationship. Relationship helps you understand their temperament and know how you need to adapt your message so they hear and respond to it. If you have a loving and trusting relationship, they will believe you when you say things like “I love you. But that behavior was not OK, so I needed it to stop. I know you can do better in the future.” If you have to enforce consequences, they’ll know that they weren’t done out of anger or lack of love for them, but were instead done to help motivate them toward better behavior. If you have a positive relationship and positive expectations for your child, they will want to live up to those expectations and be worthy of your respect. Effective discipline needs to be based in a consistent, reliable, respectful relationship. There are some “discipline tools” which don’t honor this. For example, any discipline that involves shaming your child doesn’t come from a positive relationship place. “You are so bad. You know not to do that but you keep on doing it because you’re a bad kid.” Shame might re-direct their behavior in the short run, but it doesn’t lead to them feeling good about themselves or about you. Another example is physical punishment, such as spanking. Physical punishment done in anger is very frightening to a child and very damaging to a relationship. But even well-reasoned, “logical” punishment is not the best discipline tool. It does work to change behavior in the short-term. But, it doesn’t motivate the child to do better in the future, especially when the punishing parent is out of sight. So, in our example from above: if every time a child drew on the table, you slapped their hands, they would probably stop drawing on the table. But, they would have less trust in you, and consider art and drawing to be stressful and unpleasant activities. Because relationship is so key to discipline, remember this: No matter which discipline tool you use to respond to a situation, the very first thing you need to do is connect to your child: get down to their level, look in their eyes, or touch them gently. Make sure you have their attention. Then you can re-direct, or substitute, or set limits, or whatever. And they will hear you, and remember that your request comes from the relationship: you love them and you want them to be safe and successful. To remember this step, use the mantra: Connect to Correct. This entry was posted in Discipline and tagged discipline, misbehavior, preschooler, toddler on October 28, 2015 by Janelle Durham. Siblings have lifelong companions. As children, there’s a built-in playmate in the house, a travel companion, co-conspirator and someone to bond with over how “unfair” their parents are to them. Throughout life, a sibling can be the longest relationship they experience – parents will likely die long before the children, but the sibling will still be there. Not all siblings are friends, and not all siblings love each other – that’s not guaranteed. But they do have a history together that no one can match. 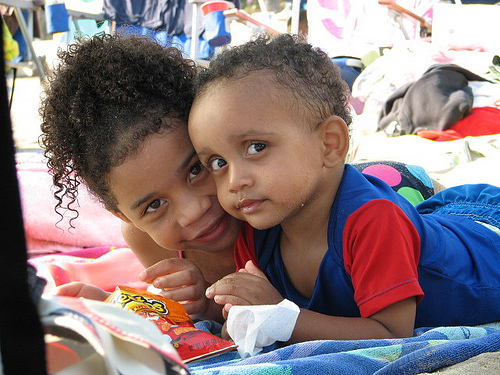 When children go away to daycare or school or summer camp together, they may adapt better. Having the sibling along helps them separate from the parents more easily. Living in close quarters with each other can help siblings to learn cooperation, conflict resolution, empathy, forgiveness, and understanding for another person’s point of view. This doesn’t happen automatically, but does happen with your support. Having to share their space and possessions all the time, every day. Feeling they are getting unequal amounts of your love, or unfair treatment. Trying to define who they are as an individual, separate from their sibling. Sometimes kids have put on their nice social graces for everyone else all day, and need a chance to vent steam with someone they know “has to” still love them later. Because they’re there – conflict gets the adrenaline pumping, which can be fun! Teach your children that most toys are communal and must be shared nicely. However, each child has the right to set aside a special place and some special possessions that are theirs alone. If the sibling wants to play with the special toys they have to ask, and it’s OK to say no. For the communal possessions and activities, try to have toys and games that work at different levels that they can play with together – open-ended toys like blocks and play-dough are great. Make sure each child gets one-on-one attention from you at times – maybe a weekly “date” that’s all about connecting as individuals. There are times only one child can do something both want to do (e.g. press the elevator button, choose where the family will have lunch). Have a way to track whose turn it is. Make sure the kids have equitable, developmentally appropriate privileges and responsibilities. Don’t be overly harsh on your older child and don’t baby your younger child. If you change any of the rules over time because it’s the right thing to do (yes, we parents sometimes realize we were unreasonably harsh in the past) have a discussion with the older child apologizing that you made them live by a rule that you’re not asking of their younger sibling. Catch them being good. Kids crave attention from you, and if they don’t get it for positive behavior, they’ll act up to get attention for negative behavior. Especially reward good sibling interactions. Encourage them to work together – when we can all have a good day, we all get the reward. Your children don’t have to do all the same types of things. If your older child plays the violin, it doesn’t mean the second one has to play the cello. She could play soccer instead. Plan their activities separately so each can follow their own passions. Don’t label your children. It’s tempting to say “he is our artist and she’s the math whiz.” But those labels limit them and block you from encouraging their development in all areas. Help your kids find ways to release the day’s tensions by sharing them with you or each other rather than by taking them out on each other. When children fight, it gives us a chance to teach skills like self-calming, being assertive, expressing concerns with words, problem-solving, negotiating, taking turns, and so on. When a battle begins, try not to jump in to solve everything immediately – see if they can figure it out. But do step in when things become hurtful. Set absolute limits that it’s never OK to hit, bite, kick, or be emotionally cruel. Before disciplining either child, make sure you have the whole story. It’s easy to assume that the older one is at fault, or that the last one holding the stick is at fault. Stop and ask each child to share their perception of the situation. Often it’s appropriate to punish both kids. If only one is punished for something, ensure that the innocent party doesn’t gloat about it! If there’s an object they’re consistently fighting over, you may find it’s easiest to just take it away from both of them for a toy timeout. If the younger sibling ruins something the older one worked hard on, first offer sympathy: “It’s so hard when she wrecks your stuff!” Encourage him to share his anger with you. Then explain that the little one just doesn’t get it yet, and think about how to protect the next special creation from them. If your child needs to vent about their sibling, let them. They can draw pictures, write, yell, whatever. They may say “I hate my brother.” Instead of scolding them, say “I know right now you’re hating your brother for what he did. I don’t think you hate him as a person, and I think soon you’ll have fun together again. But I get that you’re really mad right now.” Siblings don’t always have to like each other. You may have one child that’s easier for you to like than the other– you have similar temperaments, similar interests – you just understand them better. Gender may also affect this. On good days, we just try to be fair and equitable. If you’re really struggling with a child at some point, enlisting another friend or family member who “gets” that child better may help you figure out some new approaches. Parent educators: Here is a free printable handout about Sibling Relationships. This entry was posted in Child Development, Parenting Skills and tagged brother, parenting, preschooler, sibling rivalry, sister, toddler on April 9, 2014 by Janelle Durham.